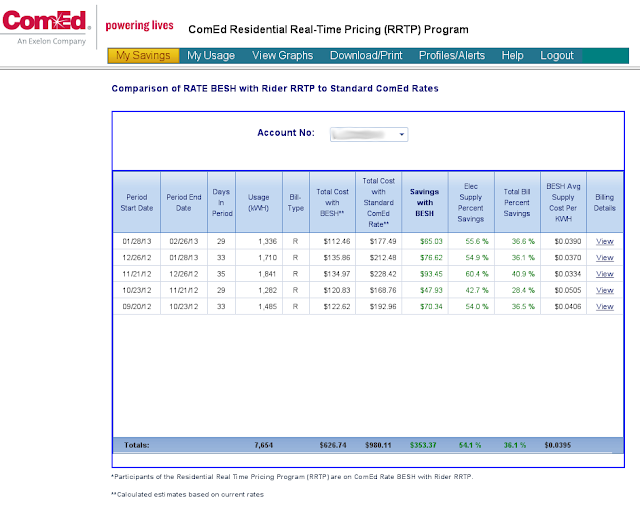 I've been on the Chicago area Commonwealth Edison RRTP (Residential Real Time Pricing Program) for about 6 months. I've been extremely happy with the savings that we have seen on the program. I blogged about the setup and equipment a couple months ago in this blog post (http://blog.trebacz.com/2012/10/comed-residentipricing-rrtp-program.html). That blog post show what the equipment, installation time, and billing cycle look like. Now I wanted to share what the savings look like to my house in just 6 months with the program. Conveniently ComEd has a referral program. They sent me an email with my savings and encouraging me to tell my friends (in turn I get a $20 credit for each person who mentions my name when they sign up). So here it is (in ComEd's words).